Quite a few years ago I sold what had been my most favorite boat of all, a Falmouth Cutter 22, because I felt that it was unlikely that I would be able to sail it again, primarily because of knee issues that resulted in quite significant mobility limitations. I wasn’t sure what I was going to do about the boat thing after that, but kept reflecting on a chapter in the John Dowd book titled Sea Kayaking: A Manual for Long Distance Touring, that I had read some time before. That chapter discussed how a man who had been a sailor, and then had an accident and was paraplegic as a result, had come to Dowd for some help with strategizing solo kayak cruising. Dowd wrote a really good chapter about the ensuing process and that man’s cruising experiences, and the story has stayed with me ever since. The Peep Hen, SERENITY, was adapted enough for me to simply be on the boat, which was enough of an adventure at the time, but the boat wasn’t entirely arranged for independent sailing. 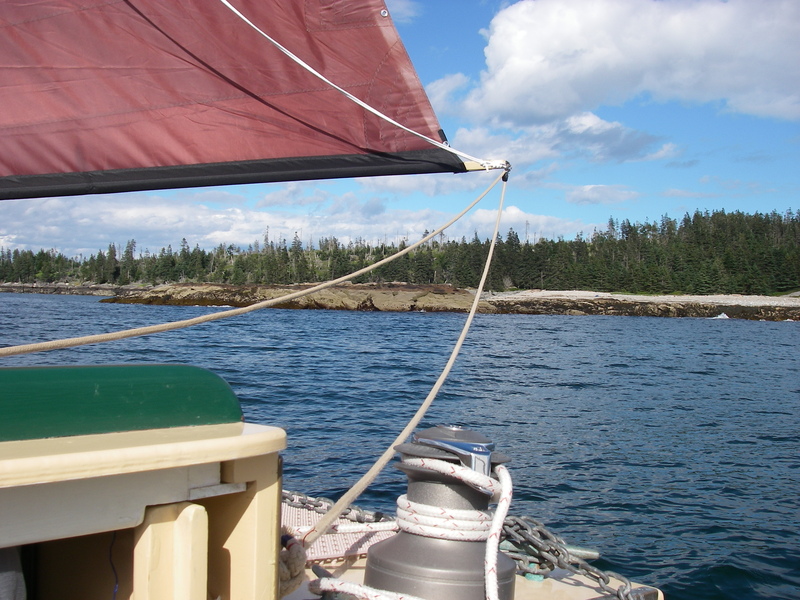 AUKLET, on the other hand, was originally built and then set up for solo sailing, by me. In both cases, the adaptations were not particularly exotic. Rather, they made use of standard boat equipment, applied in very particular ways to fit the situation. AUKLET, the Bolger-designed glasshouse Chebacco, has a raised port berth, the head described in a previous post, halyards and anchor line led to the cockpit, and an enormous two speed manual winch. There is also an easily movable cockpit slide board, and a “tiller pilot” style autopilot that fits into a socket in the starboard cockpit bench and connects to a pin in the tiller. The port cockpit bench has tapered cushions to create a flat, level surface, rather than following the curve of the sheer and the lateral drainage angle, so there’s a very flat level space for lying down, which I find helpful. The main halyard leads through a rope clutch, which holds any strain on the line until the clutch is released, and we added a special curved rubbing strake so that the mainsail can be hauled up from a sitting position across the cockpit, without tearing up the corner of the companionway. I tried a Winch-Rite portable electric winch handle, but it wasn’t a good fit for my abilities, so we took it back off the boat. At 6 pounds it was heavy to move into and out of position, and required long holding of its trigger from an awkward position while it slowly turned the winch. And it’s very loud. With a different winch position it does have potential, but not in the way that AUKLET is presently set up. A 10 inch manual winch handle with a two-hand grip, however, made a really big difference over the standard 10″ winch handle. It’s the Lewmar “one-touch powergrip winch handle.” It allows one’s upper hand to be oriented palm facing down, which is very helpful for getting the most out of available weight and strength. Some of the above items were fussy to install, particularly the anchor line which runs over the top of the cabin. But the parts are all garden variety stuff from the boat catalogs or the hardware store. Several of the parts are generally used on larger sailboats, in order to handle big-boat loads using average strength – applied to the smaller loads of a small sailboat, the jobs become possible with less than average strength. Mostly, making the boat “accessible” was about moving around in and on it, and then placing lines and gear so that distances and angles were comfortable for my particular habits of getting about and doing things. The only difference between this and other more average situations is that if a gear arrangement doesn’t fit my particular habits, it’s quite possible that for me it won’t be doable at all, or not as a repeated maneuver. So we took quite a bit of time sorting out details of how to set things up in a workable way within the fixed structure of the hull, deck, and cabin. We had tried, on the suggestion of Phil Bolger, opening up the cockpit footwell. This creates potential for rolling access between the cockpit and cabin, and for walking between the cockpit and the cabin without any up-and-down steps. I really liked this arrangement, but as it turned out, especially with the extra cushions on the port seat, even with a grate in the footwell a step was needed to be able to get up onto the cockpit seat at all (I’m about 5’7″ tall). It became easier to instead keep the footwell hatch in place and scramble from the cabin to the cockpit, and now that footwell hatch is fastened down semi-permanently, which also has the advantage of making it a lot more watertight. The rest of “accessible sailing” in this particular situation has as much to do with patterns of activity as with particular equipment. For me, this especially means not too much hand steering, and plenty of time to rest! But here’s the cool thing: the way you achieve those requirements is by sailing off on the open water, which just happens to be my favorite place to sail. In my world, it’s about a million times easier to sail all day at about 5 miles off the coast, than it is to follow a perfectly easy but narrow channel between islands or up a river that means hand steering for an hour or two. I like sailing close in when I have the pep and it doesn’t go on for too long, but I’m in sailboat heaven when the wind is right for the autopilot and it’s easy to relax in more wide-open spaces. The glasshouse Chebacco is particularly ideal for those wide-open runs, because you can spend a lot of time inside the cabin while still having excellent visibility all around. It’s restful to get out of the wind, and at the same time it’s also possible to do a good job of keeping track of traffic and navigation. When I saw the design of this boat originally, in the magazine Small Craft Advisor, bells went off immediately – my accessible boat! The details are done with further access in mind, but it’s really the design that makes it work for my particular situation. There are a couple of bits of equipment that have also been especially helpful. One, that’s pretty funny, is a cardboard periscope from the Edmund Scientific catalog. It works like a charm for checking on traffic, or buoys and shorelines, without getting up every 5 minutes. This would not be nearly so effective in a boat with tiny portholes! And the autopilot is my best friend. I carry a brand-new spare, for just in case it quits. The boat will also self-steer, when going some version of upwind, by holding the tiller in place with the autopilot adjusted but turned off, and fiddling with trimming the sails. That is both entertaining, and a useful backup skill in case of electrical disaster, besides saving electricity. Because the electrical system is so important, this system also has built-in redundancy. 150 amp hours are in one bank of six 25 amp hour, 12 volt, Group U1 size, AGM batteries, and there is a separate 50 amp battery bank (two of the above batteries) for just in case. (The small Group U1 batteries fit the available space, and have been a lot easier for people to move around.) So far it hasn’t been necessary to use that second bank, but I like knowing that it’s there, especially for the autopilot, but also for navigation lights. This system is recharged by a 55 watt Ganz solar panel on the cabin roof, which is more than adequate for keeping up with loads from the autopilot, LED nav lights, AIS, and cell phone, VHF, and dry cell charging. If I were to use the electric Torqeedo motor very much, especially when the sun is lower in the fall, I would need more charging capacity, but as things are this arrangement has worked out fine. The motor is there primarily as a safety backup and for the last little stretch of getting into and out of marina dock systems, and for this use the existing solar panel has worked out well. The other big adaptation aboard AUKLET has been the mainsail and its reefing system, which works from the cockpit by roller-furling on the boom, and is borrowed from the Paradox microcruiser design by Matt Layden. However, this sail is not entirely perfect in this situation (for which, after all, it was NOT designed!) In heavy conditions, probably because the installation is not identical to the one on Paradox, you have to do the furling just right or the sail does not roll smoothly onto the boom. This can lead to inefficient sailing, but worse, it can create uneven strains on the sail, with potential for tearing. Further, when the wind and waves are really going, and even more so in the dark, it can be downright scary to consider taking in another reef. This is not good! Overall, it’s been very interesting working with both of these boats from an access perspective. They each have significant strengths. AUKLET has the large, comfortable cabin without requiring setting up, adjusting, and taking down canvas as a daily routine. But while lines are all led to the cockpit, there are still reasons to go forward now and then, and docking and undocking without help are much, much more easily done by stepping off the boat and walking a bit on the dock. At 20 feet long, there is a certain amount of territory to be covered. For my present abilities, that’s okay, and I’ve been enjoying it thoroughly. But all along I’ve been happy to have SERENITY in the garage, as my accessibility fallback plan. The great thing about SERENITY– and Peep Hens in general – is exactly that small size (14 feet) in combination with the ability to get out of the weather. I would not take that boat straight across from Penobscot Bay to Cape Ann, but it is surprisingly sturdy for coastal sailing, and I’ve been out in winds of 15 to 20 and 3 foot seas and felt perfectly fine. It won’t make a lot of progress upwind in a chop, but with a relaxed schedule, thinking ahead, and carefully watching and working with the weather, it’s surprising what a person can do in that boat, including significant travel without much of a motor. From a mobility perspective, the Peep has several advantages. When arranged for sailing from and sleeping in the cockpit, no walking is necessary at all, including for messing with dock lines. This is true because the boat is so short, and because of the cabin design, which means it’s possible to scoot onto the gunnel, sitting, and from there, while still sitting, to slide along the top of the cabin toward the bow, with feet over the side on the dock. I know this because on one of the previous SERENITY trips there was some miscommunication about dock line arrangement, and then the crew was away from the boat for a while. This took place during a time when I was doing no walking, but as it turned out I had a perfectly fine time scrambling around and securely tying the bow line to the cleat on the dock. Gosh I like that boat! For solo accessible sailing, SERENITY would need a few more adjustments. The anchor line is led back to the cockpit, but the anchor does not drop easily from the bow roller. I have since learned that it matters quite a bit which anchor one uses, because a good deal of friction is developed when the chain part of the rode is lying on top of the cabin, and some anchor designs are weighted in such a way as to overcome that friction and fall on their own better than others. It also seems to matter, even within the same anchor design, what the weight is of the anchor being used. A 6 pound aluminum Spade will drop sometimes, but not reliably, on SERENITY. On AUKLET, a 15 pound Manson Supreme drops every single time, but the 10 pound version will not. Neither will the 13 pound aluminum Spade, nor the 33 pound steel Spade (yes, I have an embarrassing number of anchors!) This is something that would need further work for SERENITY, though I’m hoping that the 10 pound Manson will do the trick, because there is a shorter run over the tiny cabin and therefore less friction than on AUKLET. Reefing is another issue that needs to be more thoroughly addressed on SERENITY, and as I said earlier the boat needs an autopilot and a winch. But it’s all quite doable, and I’m having some fun thinking about it. The other thing that we did shortly after SERENITY arrived involved the strong smell of fiberglass, which is typical of a polyester resin boat with no liner. That smell decreases a bit in the first couple of years after construction, but my experience has been that after that initial improvement, even 10 years later there is still a significant odor. I have chemical sensitivities, apart from the various mobility issues, and this has been a big deal. So when I first got the Peep Hen, and it was clear that this was going to be a problem, we coated the interior of all the exposed fiberglass that we could reach. To do this we used West System 105 epoxy with the 207 hardener, which allows about a half an hour of working time and hardens almost clear. In small quantities this stuff is not terribly smelly at all. By the time it was all over the interior of the boat, even after curing for two weeks it was still pretty strong. But the good news is that epoxy, unlike polyester resin, does completely offgas, and it’s an outstanding sealer. It took some time, and a good hot summer in the sun, but by one year later there was no smell at all inside that boat. It’s been a very worthwhile effort. So that’s about all the adaptations I can think of. Each individual’s situation is unique to that person, so it’s an individual process to work out this sort of thing. But maybe there are some helpful ideas here, and above all, there is the idea that it might be possible. Bigger sailboats have been made that are entirely wheelchair accessible, including for overnight accommodations, lines and helm (see: http://www.disabledsailing.org/ and the book An Ocean to Cross, by Liz Fordred.) But if one’s various requirements allow, there is the “small boat and ditch the wheelchair” option. For me, there is nothing more fun than leaving the empty wheelchair at the dock – for months! These little sailboats have made it much easier to do exactly that.